The standard size for a dishwasher is 60cm wide, 82cm high and 60cm deep. Slimline models are usually around 45cm wide and take nine place settings. Measure the available space in your kitchen, and allow some room around the dishwasher for ventilation. Choose a dishwasher that can adapt to your needs. Look for height adjustable shelves, baskets for cutlery, plus racks which protect glasses and can be re-arranged to hold big pots. Check that the racks are made of metal. Make sure the controls on your dishwasher are easy to read and reach. Budget models may have mechanical knobs, while newer ones will have digital buttons and display screens. Many machines also have additive indicators on the control panel which will show you when you need to refill the salt or rinse aid reservoirs. WELS (Australia's Water Efficiency Labelling Scheme) rates dishwashers depending on how much water they use. 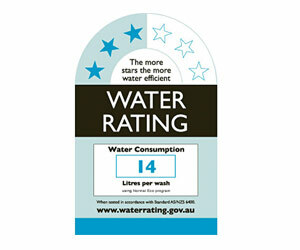 The label shows a zero to six star rating; the more stars, the more water efficient the product. It also displays the water consumption flow (litres per wash) of the product. The Energy Star Rating label gives a star rating (out of six) of the model's energy efficiency. It also states energy consumption (usually kilowatt hours per year) to provide an estimate of the annual energy consumption. Some dishwashers have energy-saving features; for example, a time delay function allows you to set the machine to switch itself on during the night to take advantage of cheaper electricity rates (check with your power company for special rates to see if applicable).